I ran across something fun on Pinterest the other day and wanted to try it out. I've seen one sheet wonder cards made with 12X12 sheets but when I saw the one for a 6X6 I had to try it! I prefer making cards from the smaller pads because the prints tend to be scaled down and I think they just work better for the small A2 cards I tend to make. I used the diagram and sketches that Julee Tillman has on her blog (http://poeticartistry.blogspot.com/2008/09/6-x-6-one-sheet-wonder-challenge.html) but I messed up my cutting somehow and ended up with something just a little different. I love her design though so I'm going to try it again. I used two coordinating sheets of 6X6 paper from the We R Memory Keepers For the Record pad but you could use a double sided paper and then it would truly be a one sheet wonder. I picked this pad up at Tuesday Morning a few weeks ago for an astounding $1.99!! If you haven't checked out the craft supplies at Tuesday Morning, it's definitely worth the trip! I used Core'dinations solid card stock for the base papers and ran the mustard color through a woodgrain embossing folder made by Darice. I used Crushed Olive and Vintage Photo inks by Tim Holtz to give everything a little bit of a vintagey and more masculine feel. 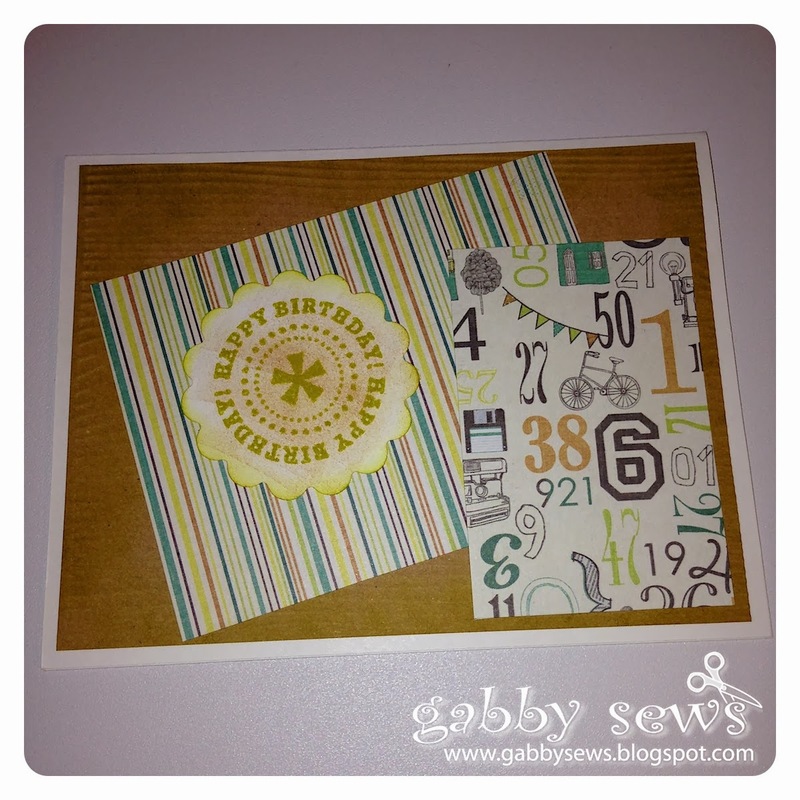 I used a Fiskars Happy Birthday sentiment stamped onto a scalloped circle I punched with a Fiskars 2" punch. 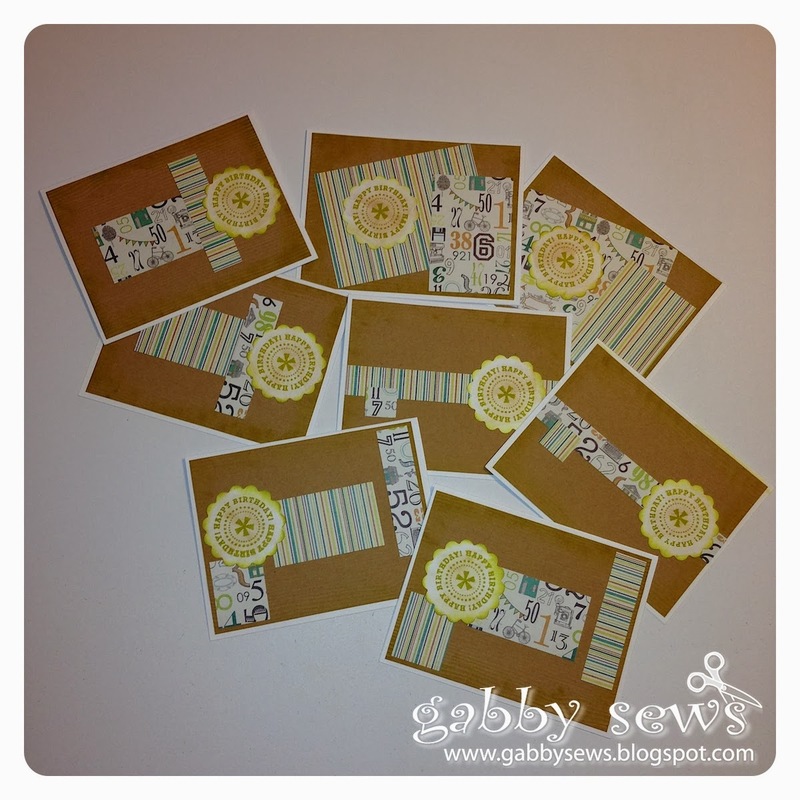 I ended up making 8 cards with no waste from my pattern papers at all! I have a hard time throwing away scraps so using this technique will definitely help me wrangle all those scraps. These cards are going into my Operation Write Home box that is just about full!